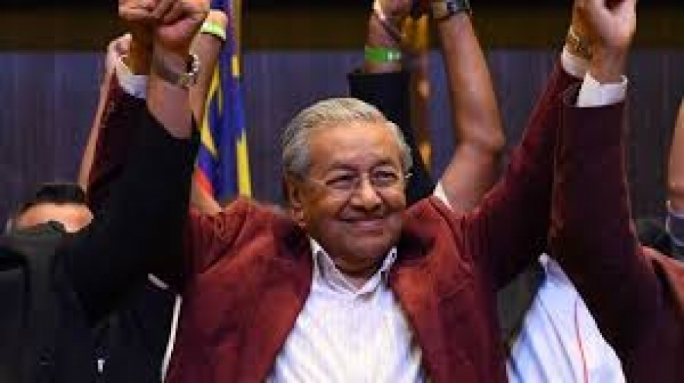 Former Malaysian PM, Mahathir Mohamad is to become the world’s oldest elected leader at 92, after defeating Najib Razak in a fiercely contested election that put an end to the ruling coalition’s six-decade hold. Mahathir was prime minister between 1981 and 2003, and has now led the opposition coalition, Pakatan Harapan, to its first election victory since Malaysian independence in 1957. He will be sworn in by the king on Thursday. His historic win has ousted the Barisan Nasional (BN) coalition, which has been in power since independence in 1957. Jubilant Mahathir supporters filled the streets as the victory became clear. Najib has said he will "accept the verdict of the people", but correspondents say a smooth transition to power is not a given after such a major political upheaval. No single party within the coalition won a majority, so technically it now rests with Malaysia's king to decide who forms a government. "Yes, yes, I am still alive," Mahathir told a news conference in the early hours of Thursday. He said his coalition would not seek revenge but would "restore the rule of law". He also announced - to cheers among his supporters - that there would be a two-day public holiday, adding: "But there will be no holidays for the winners." The official results showed the opposition Pakatan Harapan - the Alliance of Hope - secured 113 of the 222 seats being contested, including some which have only ever been held by the government. BN took 79 seats.